Climate change and injustice made Hurricane Maria much worse. That’s why we must stand with Puerto Rico for immediate and equitable relief efforts. 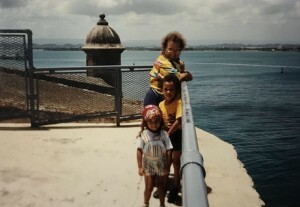 As a child, I spent summers in Puerto Rico visiting mis abuelos (grandparents) in their beautiful home in Carolina, a suburb of San Juan; chopping caña, playing in the waterfalls of El Yunque (the only national tropical rainforest in the U.S.), visiting family in Ponce, and salsa dancing in the streets of Viejo San Juan. I write this with a heavy heart during this unprecedented crisis on the island my family calls home. As we waited to hear from friends and family after the hurricane made landfall, all I could think about was how alone my grandma must be feeling without power, listening to the horrible sounds of the wind slamming her window and water filtering into her apartment. Mi abuelita is a “tough cookie” — as my tio says — and has weathered many storms in the past. She and her home came out ok. But, nothing can compare to the devastation that has unfolded for the rest of her community; her isla. The governor of Puerto Rico declared it the worst catastrophe in the island’s history. Relief has been slow and no communication exists to remote communities. For most of the island, power will not be restored for weeks, maybe even months. This means lack of safe drinking water, no food storage, critical storage of medical supplies and no life-support services for those communities that need it most. And this climate crisis has been compounded by years of social tragedy and injustice. The island has an unemployment rate twice that of the United States (11.5 percent compared to 4.4 percent) — forcing hundreds of thousands of residents to leave the island. In response, the government has been forced to take on more than $70 billion in debt and has been unable to pursue needed infrastructure maintenance and modernization. That made the island even more vulnerable to climate change-fueled disasters. The tragedy in Puerto Rico is another example of what happens when climate deniers ignore basic science and harsh realities. It is a reminder to America and to the world that an unstoppable forces far beyond anything imaginable are already in motion; their impact will be less predictable and more difficult to control and recover from. And it frightens me to wonder, is there a way out of this mess? It shows the sad reality that environmental injustice hits lower income communities and people of color hardest. Climate justice demands we all take action to help Puerto Rico right now. Especially from those of us in the continental United States, which has benefited so much from the island. From cultural exploitation, through economic guinea pigs and medical experiments, and wars the populations has sacrificed so much. And Puerto Ricans are U.S. citizens that have fought and died for American ideals in every armed conflict since 1899. We deserve to be treated as citizens! 1) Climate Justice Alliance is forging a scalable, and socio-economically just transition away from unsustainable energy towards local living economies to address the root causes of climate change. Stand with Puerto Rico and show your support by signing the petition to Congress calling for policy change to advance a JUST RECOVERY in Puerto Rico. 2) ConPRmetidos is working to improving personal lives by rebuilding marginalized and vulnerable communities, so they can jump-start community driven efforts on behalf of further relief and productivity. 3) Taller Salud is a feminist grassroots organization working to support immediate relief, recovery, and equitable rebuilding in Puerto Rico for the communities hit hardest by the storm. 4) Casa Pueblo is committed to appreciating and protecting natural, cultural and human resources on the island. 5) United Way of Puerto Rico focus is on education, financial stability and health as the pillars to achieve a good quality of life. Currently, the financially support over 130 participating non-profit organizations and partner organizations that provide direct services to: children, youth, adults, and the elderly. This problem won’t go away on it’s own, we need to make strides to changing our current climate. Demand climate action now!